My woodworking hobby started a couple of summers ago. A friend gave me a router as he was downsizing. I was not too sure whether my new hobby would stick and was not sure how much gear I would acquire. 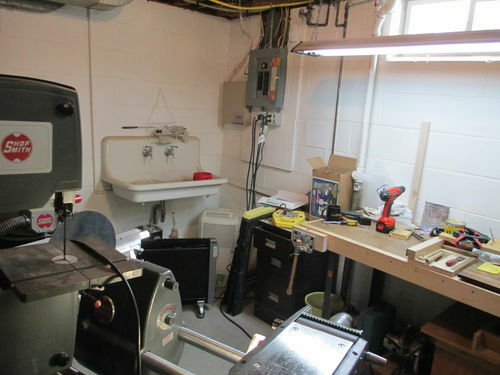 in February of last year I decided I would continue with woodworking and purchased a ShopSmith Mark V model 500 and started setting up a shop in a 9×13 area in the basement. For my small shop the SS MKV was a great idea. 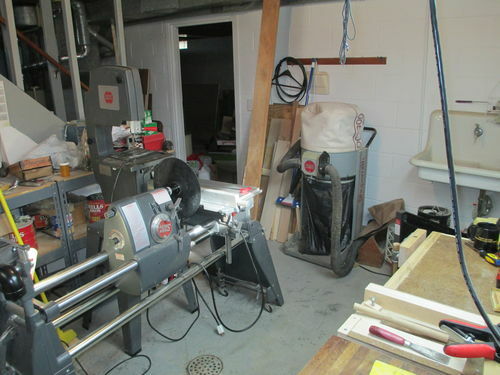 I added SS belt sander, jointer and band saw to the shop, with the band saw having its own stand. Also eating up floor space is a SS Dust Collector. Space is tight in the shop, but I have made it work up to now. Last month I got a second SS. 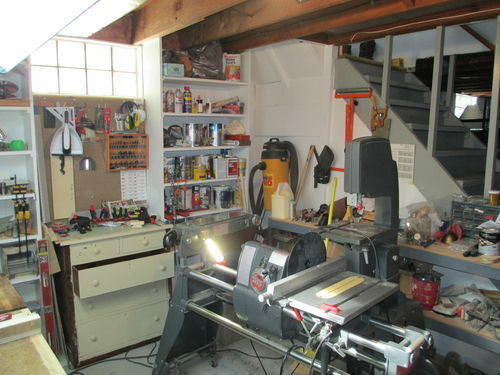 It is a Model 510, which about doubles the table space for the table saw function. Then last week I got a SS 20” Scroll Saw on its own base and no I have not even tried to put them in the current shop. 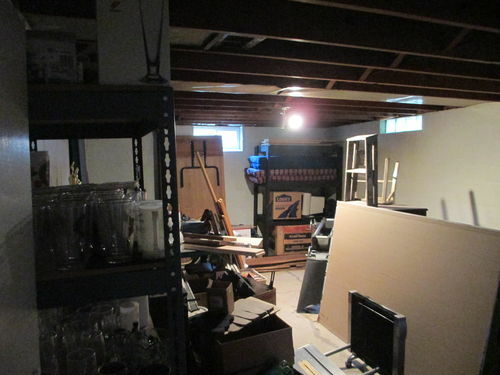 I had to deride if I wanted to sell one of the SS machines or move into an area of the basement I had thought would have a pool table and bar. I am a beer geek and play league pool 3 times a week so this was not an easy idea to give up. (BTW it’s once a week for league pool in the summer 8-]). So, the decision is to move the shop to a 13×28 room has been made. The room has a single light and no outlets, so I will be having an electrician for more than just moving the 230 outlet used by one of the SS MKVs. Thinking this all out and documenting my progress is the purpose of this blog. The blog may not be of interest to anyone but me, but I would love to have comments from others make this a better experience. The next step would be to put in a couple of rows of fluorescent fixtures and a couple of 20 amp circuits of wiremold mounted on the exposed floor jousts overhead. The basement is about 7’ from floor to main level floor joust, so the outlets would be an easy reach for me. 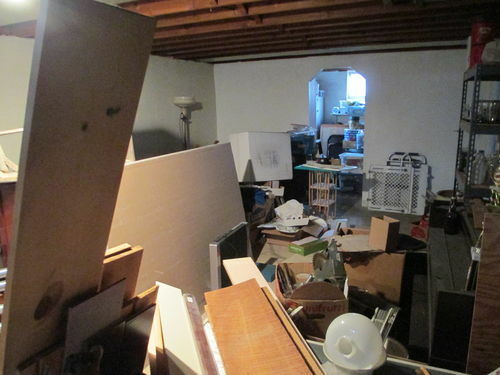 Another item I will have to deal with is staging the storage of existing stuff/junk when I start moving from the current shop to the new shop and vice versa. A lot of this problem is the volume of stuff currently stored in the new shop area. By rolling gear around, I have been able to work in the shop up to now. I like the idea of a storage system like this. If I may suggest, I often install retail perimeter fixtures and millwork using wall cleats which are basically the same principal as this. It might be an easier and more forgiving system too. A rip of MDF, or Plywood on a 45 degree bevel. In fact take some 10” rips and rip those in half on a 45 bevel. You have the cabinet cleat and the wall cleat with one pass on the TS. I think they might be more forgiving in this sense: the wall, and studs behind the wallboard might not form a straight plane. 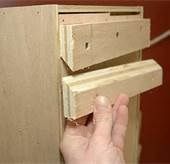 (Very likely) (You need to shim the slat straight to the furthest stud out of plane. Care would need to be taken if installing the slat wall type cleats shown in the picture, whereas the beveled cleats don’t force you to put your cabinet back down and readjust. If there is a bow in the wall, and your cabinet is straight, the slat wall system may be difficult to seat. +1 to bucket head. I thought about that system when I updated my shop but opted for the 45deg french cleat system since it is much more forgiving if the walls aren’t completely flat. 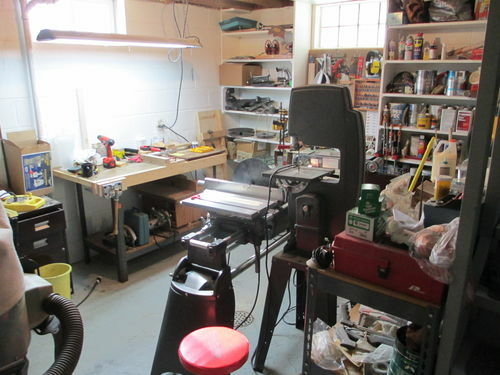 I’ll be moving in next few months so my shop will redone….yet again, so I look forward to seeing your progress. I have bare block walls right now, I need to check how flat they are. I am expecting I will find they are bowed. Not sure what I will do. Some of the items being hung on the walls can be pretty heavy and project a ways out from the walls. On the ShopSmith forum I got pointed to this discussion. Starting at post #70 he shows/describes storage he is building, which is based on my earlier link. In his system he uses 1/2” OSB for the spacers and 7/16” OSB faces for his hooks. So there is an 1/8” of play in his hooks. I understand this hook system, not sure I got the drift on the 45 degree cleat system mentioned above. Seems like the full hook would be stronger/more secure than the lip of the edge of a board… like I said, I may not have understood buckethead’s cleats or just how strong that would be. You can see many images of this type of system by using google, bing, yahoo search engines. Type in “French cleat”. You can get a lot of storage by building drawer units with work top space on them and wall cabinets do very good as extra storage space also. I have no problem hanging a lot of weigh from the french cleat system. As you can see in Buckethead’s pictures, then the two halves meet, they it is creating a large amount of contact surface area. Since the piece attached to the wall is angled down and towards the wall it locks tight when weight is applied. I see no problem hanging anything from it as long as the cleats are securely anchored to the walls and attached the item you want to hang. if you want to be even more secure you can add multiple rows of cleat to hang extremely heavy stuff. And as ksubenny states, it is a lot easier to put together, just rip 45deg and away you go. You can see the system and how i installed it in my shop tour video starting around the 2 min mark. buckethead, Thanks to idea. It was late last night. Been doing some reading. looks like the french cleats are will do the same thing as my SS forum poster’s hooks, but with no 1/8” room for error required. helluvawreck, I was planning on some role-around storage when I was trying to fit everything into my current shop. I am thinking specifically of the cover story from ShopNotes issue #126. It’s titled Multifunction Storage Cart System. 2 Role-around storage carts, expandable workspace, and workspace with track hold-downs are its features. This plus a role-around cart for my Shopsmith Special Purpose Tools (SPT) and role-around cutoff bin are/were on my list of shop improvements. The totally mobile idea was needed in my small area and sounds like a good idea anyway. I am not known for being organized, but I want a place that every tool calls home. That is firstly so I know that I have put things away, secondly so maybe I can find them again. But because I am not very organized I have trouble deciding where everything should go. Being able to move things around with no impact should make it easier to assign homes to everything and change my mind later if there is a smarter way to do it. Well, that’s the hope 8-]). ksubenny/John (Hoakie), Thanks for comments. I don’t know about spacing of cleats along the wall, I thought 3 or 4 rows. John, I enjoyed your shop tour and seeing the ways you are using the cleats. ‘farmer’ in the SS forum link tied his OSB to a ‘2 by’ sill plate that was on top of the block wall.. 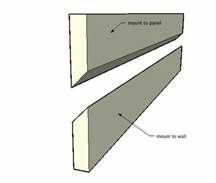 I do not have a sill plate so I am not sure how I will connect my sheeting material, but plan to hang from top like ‘farmer.’ Also like ‘farmer,’ I am not planning to frame in a wall, just back the OSB (or whatever) with moisture barrier foam and leave the bottom of the wall painted blocks. I want to put a plan together for this wall of my new shop in my next blog. You guys have about sold me on French cleat idea. I wish I could get sketch up to work better for me so I could show how I think the storage system will go in.